The Institute of Finance and Management requires its certification-holders to fulfill a continuing education requirement annually in order to maintain their certification. Continuing education, which covers a large range of activities whose purpose is to better equip you to excel in your specific career field, is measured in Continuing Education Units (CEUs). CEUs are awarded primarily as 1 CEU per hour of continuing education within your current certification compliance period. You cannot log CEUs from before you were certified or from outside of your current certification compliance period. When logging your CEUs in your account, you are allowed to round to the nearest whole number. CEUs do NOT rollover into the new year. We encourage you to do more than the minimum requirement; however, every year when your certification renews, your CEU total will reset to zero. The continuing education requirement does not apply to our certificate programs (APSC, APPSC, CESA) or to those who earned a CPRS certification from 2017 on (who are required to resit the exam every two years to maintain compliance). These activities are pre-approved for CEUs, but it is your responsiblity to log in your account. Calculate your CEU total to log in your account based on the guidelines below. IOFM has final authority on the acceptance of individual activities for CEU credit. Interdisciplinary activities: 25% of your CEUs per year can come from a related "discipline." For example, if you hold an APM or APS certification, you could submit accounts receivable continuing education for up to 4 CEUs per year. Certification classes, whether onsite at one of our conferences, live online or self-study: We know that earning your certification takes a lot of time! However, the nature of continuing education is that it is additional training you do after you are certified in order to keep up with the standards set by the program. Therefore, earning your credentials does not count towards your CEU requirement. If you already hold an IOFM certification, you may count subsequent certification classes for 6 CEUs towards that previously-held certification. Required training for your current role/work assignments: Projects/assignments that are part of your job responsibilities or training that you have to take in order to do your job does not count towards CEUs. Training on technical AP, AR and accounting platforms: Similar to the above - Learning how to use software required for your position does not count towards CEUs. For example, if your company switches to a new T&E software, and you are required to participate in a training as part of the implementation project, that would not count for CEUs. Community service: We love being a part of and serving our community and hope you do, too! However, this does not count towards your CEUs to maintain your certification. IOFM strongly recommends including a verification document when submitting CEUs. This is some sort of documentation that verifies your attendance and/or the eligibility of your activity (the latter being more so important when it's from outside of IOFM). In the case of an audit, IOFM staff will review these documents to help determine whether you are meeting the continuing education requirement. 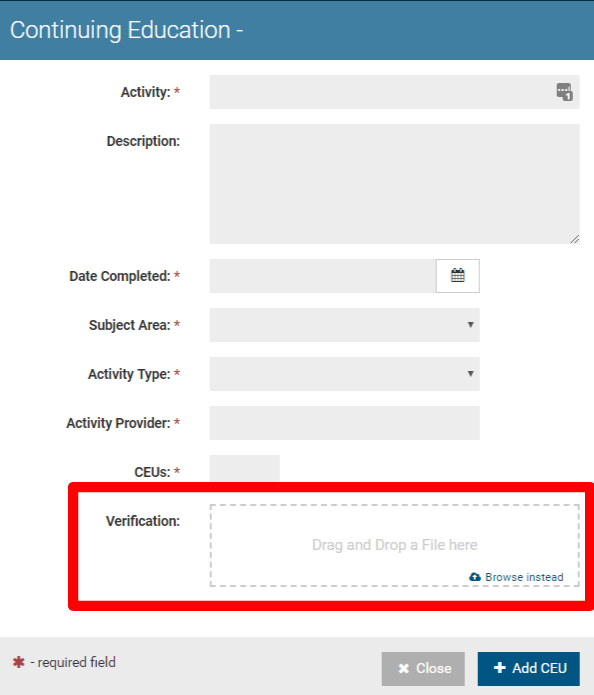 The option to add a verification document appears each time you add a CEU - see below. YOU are responsible for logging your CEUs in your account before your certification compliance date. Watch this tutorial for a quick walkthrough of logging your CEUs.